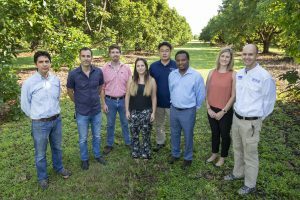 HOMESTEAD, Fla. – They don’t wear capes and tights, but the new University of Florida (UF) faculty members hope their research will help grow the state’s agriculture and natural resources, and stave off enemies that threaten industry. The eight scientists, based at the Tropical Research and Education Center (TREC) in Homestead, Florida, are bringing new research techniques and helping to shore up current research in a state that has recently faced several challenges. The research and education center is part of the UF Institute of Food and Agricultural Sciences (IFAS). Elias Bassil, a molecular stress plant physiologist, uses biotechnology — or gene manipulation — to find ways to breed plants that won’t succumb to stress. He is working with other scientists and growers in Mexico, Colombia and the United States to grow vanilla in South Florida. “It’s a collaborative effort; another researcher, Randy Ploetz, is working on breeding varieties that are disease resistant, and Alan Chambers, an assistant professor of genetics and breeding tropical fruits, brings his relationships with industry,” Bassil said. Also, Bassil is working on breeding fruits and vegetables that are low in potassium. High potassium can cause everything from dehydration to low blood pressure to changes in the heart’s rhythm. “I am collaborating with a medical doctor who wants to produce these crops for market. 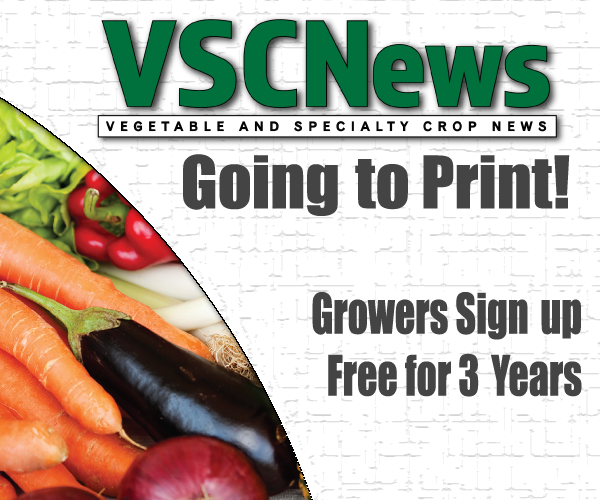 We will start with lettuce and tomato, but it will be 18 months before we see results,” he said. Haimanote Bayabil is the newest addition to the UF/IFAS Tropical Research and Education Center faculty. Bayabil believes that improved technologies in agriculture not only increase the viability of food production but also save lives. The Ethiopia native, who most recently worked at Texas A&M University, will focus on agricultural water management. In addition, Brym is helping UF/IFAS establish the research and Extension legs of the agroecology program. Agroecology is the sustainable production of goods through farming that emphasizes diversity and ecosystem function. “We want to frame agriculture as an ecological system, which sustains crop production, conserves natural resources and maintains social equity,” he said. Daniel Carrillo is an assistant professor who investigates solutions for laurel wilt, a disease that is decimating the $100 million a year avocado industry in Florida. The tropical fruit entomologist joins a robust team of scientists researching ways to stop the beetles that spread this disease. Also, he has most recently discovered an invasive mite that feeds on lychee. According to Carrillo, Florida is the number-one producer of the lychee in the United States, a small rounded fruit with sweet, white, scented flesh, a large central stone and a thin rough skin. Approximately 90 percent of Florida’s commercial production of lychee is concentrated in Miami-Dade County. “We are investigating ways to mitigate this pest, so that the industry is not impacted,” he said. Alan Chambers, who focuses on tropical fruit genetics and breeding, wants to bring a taste of Africa to Florida. Chambers is working with growers on production of miracle fruit, a small, red berry that is native to Benin, Ghana and Nigeria. “The unique thing about miracle fruit is that the flesh has a mildly sweet tangy taste, but it has a molecule that binds to the taste buds and cause sour foods to taste sweet,” Chambers said. In addition, he is investigating future climate scenarios projected for Florida to see how scientists can better prepare Florida’s agriculture and natural resources for expected changes in weather patterns. “Science tells us many things, including climate and sea levels are going to change in the future. But, it is not clear how the foreseen changes affect our water resources, crop production and ecosystems. Computer modeling is one of a few scientific ways to precisely predict our future,” he said. Geoffrey Meru, a vegetable geneticist, hopes to develop fruits and vegetables that are resistant to invasive pests. He studies and grows squash, zucchini, butternut and watermelon. Meru not only uses traditional tools such as greenhouses, screening and pesticides, but also applies advanced genetic editing to find the genes that help plants resist attacks from pests. Now, he is trying to grow seed-oil pumpkins. Ashley Smyth, an assistant professor of biogeochemistry, studies how nutrients, such as carbon and nitrogen, cycle between the air, water and soil. She is usually covered in mud when she is working in the field. “I still get this sense of excitement when I take samples,” she said. “Each soil sample contains a whole world, invisible to the naked eye, and has its own story to tell.” One story of particular interest is how human activities and sea level change affect Florida’s soil and water quality. For Smyth, working at TREC is a dream come true. “The location of the Tropical Research and Education Center, at the interface of the Redland agricultural area, Biscayne Bay and the Everglades, offers a unique opportunity to answer fundamental questions about biogeochemistry. Understanding how nutrients are recycled within coastal habitats like wetlands and seagrass beds, will help to foster new ideas for the conservation and management of South Florida’s natural resources,” she said. Currently, she is working with UF/IFAS Extension agents to move oyster shells from Miami-Dade County restaurants to other counties where the shells can be used to restore Florida’s oyster reefs. “My goal is to turn research into programs that help raise public awareness of the benefits that Florida’s ecosystems provide,” she said.